A panel discussion and networking event hosted in partnership with pineapple DC. Your ticket includes a glass of rose and small bites by Bi-Rite. A cash bar will be available. Shopping at Bi-Rite Market differs from your typical grocery experience, and longtime customers know it goes beyond their selection of seasonal produce and bountiful deli items. As customers, we see their commitment not only to providing an exceptional shopping experience, but to creating a better food system in its entirety. pineapple DC, a DC-based community for women in food, will be popping up in San Francisco this weekend to host a conversation and panel featuring four Bi-Rite alums who have taken their service training and experiences into the world beyond 18th Street. Get an insider’s look into the world of Bi-Rite - from Bi-Rite service training meetings to maintaining a robust company culture. Learn how these women have applied such knowledge in their work with small businesses, students, and underserved communities throughout the country. As Head of Marketing for the Capital Area Food Bank in Washington, D.C., Kirsten helps provide 12% of area neighbors with nutritious food. Her perspectives on food access have been cited by USA Today, ABC 7 and DCist, among others. Prior, Kirsten worked for four years as Marketing Director for Bi-Rite, where she learned all of the best things she knows about food and relationship building. Kirsten will host Who’s Hungry, a food interview podcast on DC's new Full Service Radio at the Line Hotel DC, and has moderated panels for General Assembly and the Good Food Retailers Collaborative. She holds a BA from Stanford University and a degree in Food Journalism from the French Culinary Institute. Follow her at @kikobuff on twitter/instagram, and kikosfoodnews.com. Ariel lives for the intersection of women, entrepreneurship, good food and sustainable agriculture. She started pineapple DC in May 2015 as a way to mobilize the women in food and women interested in food community in DC and beyond in order to create a better food system together. She also helps established and start-up food & beverage companies, such as Stumptown Coffee Roasters, Hot Bread Kitchen and Chaia, in sales, business development, branding and marketing. Her work has been featured in Bon Appetit, Cherry Bombe and the Washington Post and she will host “pineapple radio”, a podcast about the women, ideas, and destinations that we #pinefor in the food world, on the new Full Service Radio at The Line Hotel DC. Follow her at @arilp23 on Instagram and www.pineappledc.com. Allison Ball is the founder & principal of Allison Ball Consulting, where she focuses on both the product & retail side of the specialty food industry. She helps producers of packaged products understand the ins and outs of wholesale, and how to get their products on the shelf, and assists specialty retail stores with their product assortment, merchandising, and staff development. Alli has lived down the street from 18 Reasons for ten years with her husband and their dog. Read her full bio here. Find her on Instagram at @itsalliball and on Facebook @AllisonBallConsulting. Anna is an aspiring art teacher, and currently works at TaskRabbit HQ on the community team. Before working in tech, Anna was the GM of Bi-Rite Creamery, and has worked in over seven different positions in the Bi-Rite Family of Businesses. Susan moved on from years managing catering events at Bi-Rite into the kitchen. She has worked as a chef at Chez Panisse in Berkeley, Agern in New York City (Contemporary Scandinavian fare by the co-founder of Copenhagen's Noma) and Insa in Brooklyn. 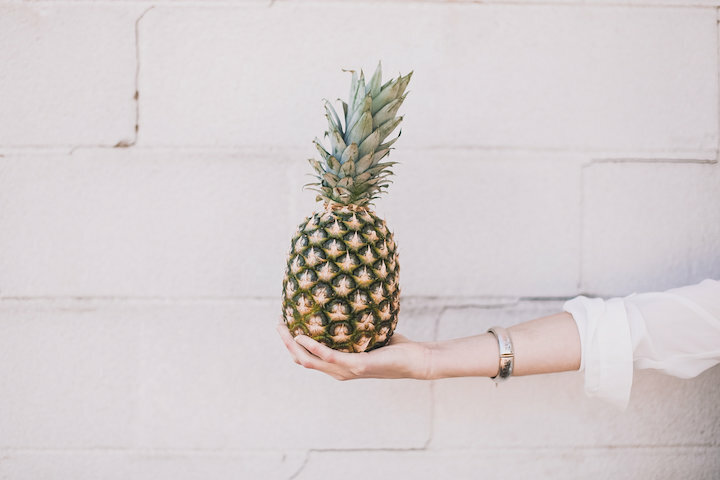 pineapple DC is a community for women in food that seeks to connect the good food movement with the foodie world to create a better food system. pineapple DC creates good vibes and a network for women to support, collaborate and celebrate one another. we highlight the work of incredible women by hosting beautiful, inspiring events, and we’re so excited to pop up in SF to connect with the women-in-food community in the bay area. pineapple believes admiring others and developing a curiosity and fangirl-like passion for the world has a lot of value in building a community and insight. that's why we "pine for" other women, ideas, brands and destinations in the great big world of food--from policymakers to celebrity chefs, from the culture of agriculture to the power of fermentation, and from farms to food banks.